We've been providing Google with data and photos for Google Maps in English and Czech for about a month, and we've now started providing them this data in German. If you take a look at this search for Pizza Rialto in Prague, you'll see that the hours of operation are listed in German as well as, for some reason, Czech. Now that we have links to the Nelso.de site on Google Maps, German tourists to Prague should find the Nelso.de site more easily. It's been rumored for some time that Burger King would finally start opening restaurants in Prague, but a recent job posting looking for workers for a Burger King restaurant in the food court of Metropole Zlicin leads us to believe that the opening of the first Burger King in the Czech Republic will happen sooner rather than later. I personally can't wait. 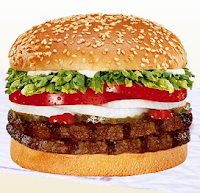 I've always liked Burger King more than McDonald's, and it's about time to have another burger chain in the Czech Republic (the only other international fast food chains in Prague are KFC and Subway Sandwiches). Update: Burger King did finally open in Prague in early December 2008. 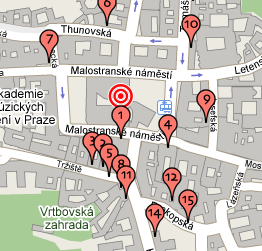 You can find more info and a map here: Burger King at Metropole Zlicin. When we started adding U.S. listings to the Nelso database, we added a number of new categories to the system. Some of these have been difficult to translate into all the other languages we support, especially Slavic languages like Polish and Czech. One category in particular has been impossible to translate into Czech: "Coffee Houses". The idea is that a "coffee house" is something different from a "cafe", in that a coffee house is more of a quick place to grab a coffee, and will often have only counter service. A cafe has waiters and a food menu, and is a place to sit for hours drinking coffee, smoking cigarettes, and talking with friends. The distinction is of course blurry (you could sit for hours in Starbucks writing the great American novel on your MacBook), but generally I think of a place like the Cafe Slavia in Prague as being quite different from a Caribou Coffee in Minneapolis. Germanic languages like German (Kaffeehaus) and Danish (Kaffebar) do have good translations, but not so in Czech. 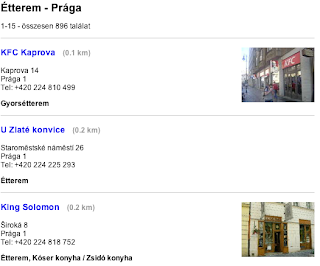 So we've decided to take the easy route, and simply call these places "káva sebou" in Czech ("Coffee to go" in English). 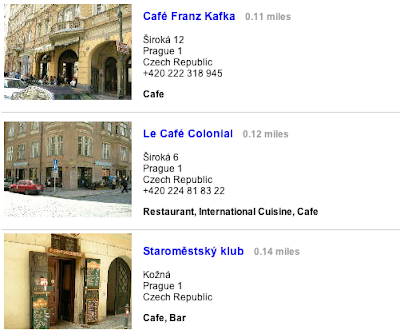 Perhaps the guys at Coffee in Town (a niche local search provider offering a guide to Prague cafes) can come up with a better translation for "coffee houses" on Nelso. 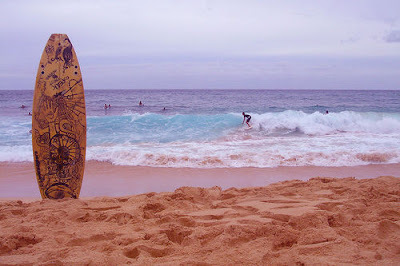 We've finally taken the plunge and launched a Nelso site targeted at the United Kingdom at www.nelso.co.uk. We've owned the UK domain since the time of company's founding, but haven't activated it until now. We were prompted to do so because of the very low traffic we get from the U.K. despite the fact that Prague is a very popular place for Brits to get completely pissed in one of the city's many bars and clubs. We believe this is partially the result of Google preferring .co.uk domains when doing searches from the U.K. Speaking of "pissed" - where I come from (Minnesota), this adjective means "angry", not "drunk". Thus, we had to make a number of changes to the translation on the site, to convert it from American English to British English. 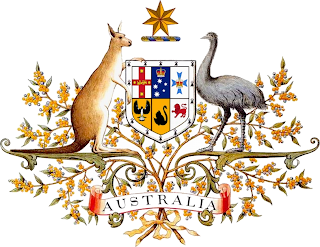 "Pubs" become "public houses", "lawyers" become "solicitors", and so forth. We don't have any Brits on staff, so we'll have to run this translation by a native speaker to work out the kinks. For more on the difference between UK and US English, you might want to check out M Lynne Murphy's blog, or try watching the UK and US versions of The Office back to back. 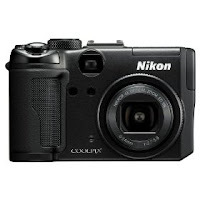 About 24 hours ago, I finally received my Nikon Coolpix P6000, the first quality Nikon compact (i.e. "point and shoot") camera with built-in GPS. I was quite eager to test this camera, for reasons obviously related to Nelso's goal of collecting business data for most of the world's major cities. Over these 24 hours, I've used the in-camera GPS under a variety of conditions, and can report that the quality of the GPS, while not up to the standard of a high-end handheld unit like the Garmin 60CSx, is still very good, and more than satisfactory for most uses. This is just a test of the GPS inside the camera. If you want a full review of picture quality, RAW file formats, lens focal lengths, etc. it's best to wait until a site like dpreview.com or kenrockwell.com do a full write-up. Currently the camera is so new (even Flickr isn't tracking the P6000 yet) that no full-length reviews are available. I'll jump right into the accuracy testing, and then will finish up with a few general comments about the GPS hardware. In all of the examples below, the marker labeled "A" marks the spot where the Nikon P6000 GPS thought I was standing or driving (more on shooting from a car below), and the marker labeled "B" indicates the correct position. Below are photos I shot with the camera once I'd turned on the GPS and allowed it to get a strong signal from six satellites. Under these conditions, the error is approximately 3-10 meters (9-30 feet). I was curious to see how the Nikon P6000 would perform when shooting from inside a moving car, where the GPS would have a limited view of the sky (I was in a minivan, not a convertible), but would still be able to track a few satellites through the windows. Despite having been in the car for more than 10 minutes (and thus not having a clear view of the sky for that time), the GPS performed remarkably well. The error was between 30 and 100 meters (90-300 feet) under these conditions. What happens when the camera has no view of the sky for a few minutes, and then is taken outside again? In this case, I left the camera inside for about 10 minutes, then went back outside. I let the camera get an initial track on a few satellites, but didn't give it the time it would need to track 4+ satellites and thus get a more accurate reading. This seems to me a reasonable test case, as many users will go inside a building for a while, and then come out and start shooting very soon after having a view of the sky. Performance was not bad (about 36 meters/110 feet off). In this case, it would have been more accurate to not have let the camera get a fix on my location at all, and have it fall back on its last recorded position (right before I entered the building on the right of the map above). In this case, I took a photo after having been inside a shopping mall in Prague for more than half an hour. Thus, there was no chance that the GPS in the camera could get a reading. What the camera did do was use the last valid GPS position that it had recorded before it lost satellite reception, placing me at the entrance to the mall itself. This seems to me a very satisfactory solution (more on this below). When I took the camera out of the box and turned on the GPS, I actually thought the GPS in the camera might be broken. Even standing in the middle of a parking lot with a clear view of the sky, it took over 10 minutes for the camera to detect even the first satellite. While it's not unusual for a new GPS unit to take a while to get an initial fix on its position (the GPS has no idea even approximately of where it is; for all it knows, it might still be at the factory in Vietnam), an initial startup time of more than 10 minutes is excessive, and might lead other purchasers to believe as I did that the GPS is actually broken. What's more disappointing is that the time to fix an initial position, after the camera has been off for a few hours, can still be 3-5 minutes depending on your view of the sky. I think some users will not pay enough attention to the GPS and will start shooting before the GPS has a chance to fix a position, leading to photos with no embedded GPS data. Once you do get an initial fix on position, the camera updates its position data every 5 seconds, and this works well. If you switch to "GPS" mode on the camera (the display will then show a live update of your GPS coordinates as you move) it's clear that it tracks well. It's just that it'd be nice if, after leaving a building or turning on the unit in the morning, it wasn't necessary to stand out in a clear area for five minutes holding the camera up in the air before taking the first picture. Although the camera will show the location of satellites that it is tracking and your current coordinates on the display when in "GPS" mode, it is missing the all-important "accuracy" number. 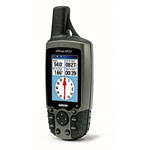 A dedicated Garmin GPS unit will not only show how many satellites it can see, but also an estimate of the accuracy of the coordinates that it is reporting. This is very useful when trying to determine if you are standing too close to a building, or under too much tree cover to get a good reading. The Nikon P6000 simply uses a three-segment display to show accuracy, and the third (best) segment seems to light up whenever accuracy is better than about 50 meters / 150 feet. This is not good enough. Hopefully a firmware update can add accuracy numbers to the GPS display, or at least add another few steps to the accuracy scale. When you go inside a building, or any other area where GPS can not be used, the camera will use its last position to tag photos with location data. You can set the "time to live" of this GPS position data, which is very useful. How it works is this: you tell the camera the maximum age of the last point to use when tagging photos when it can't get a current fix on position. You can set this to anywhere from 15 seconds to two hours. Thus, if you have a "maximum validity" of one minute for GPS data, and you take a photo 30 seconds after losing contact with the satellites, you will get GPS data in the photo, but if you take a photo 90 seconds after losing contact with the satellites, you will not get GPS data in the photo. Assuming that a user sets this to something useful like 1-2 hours, this will be a great feature for tourists. You won't be able to track yourself as you move around the Louvre in Paris, but at least all your photos from your tour of that museum will be tagged with a location at the entrance to the building. Good enough. You can set the time and date on your camera (but not the time zone) using the built-in GPS. This seems like an obvious thing for the software to support (of course, you never know; the iPhone still doesn't support cut-and-paste), but I'm still glad they included this feature. My experience with other Nikon cameras like the D40 is that the on-board clock is quite inaccurate. What's the GPS chipset in this thing? None of the spec sheets that I've come across were able to tell me what GPS chipset is used inside the P6000. Knowing this would have given me a better idea of what to expect in terms of accuracy. I guess we'll have to wait until someone takes one apart to find out. I must say that I am quite pleased with the P6000, and that the accuracy of the GPS is easily good enough to make it useful. For most consumers, even accuracy of 100-200 meters will make looking through travel photos much more enjoyable (no more "Where was this shot?"). For our use, it will also work, assuming we take a few precautions to make sure we always get the best possible accuracy from the camera. However, if you want really accurate GPS data, especially in more demanding situations (very close to tall buildings, under extensive tree cover, inside a moving vehicle, etc. ), the best route is still a camera paired with a dedicated GPS unit, either tethered directly to the camera, or recording your track to be synchronized with the photos later using an application like GPSPhotoLinker. 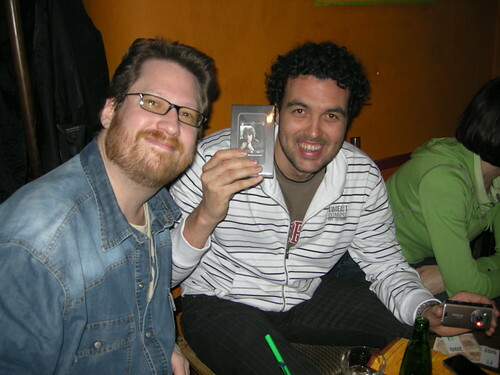 Nelso will be co-sponsoring (along with GoodData and Newstin) a TechCrunch/CrunchGear meetup in Prague on May 23, 2008. 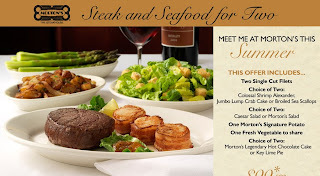 The event will be held at Restaurace Zvonařka in Prague 2. You can read more about the event in this post on TechCrunch, and you can sign up through Facebook. I've had a brand-new iPod Touch on my desk for about a month. I've always meant to run some sort of contest on Nelso, but couldn't decide what to do. I thought about running a contest to encourage users to add tags to businesses, a contest to add new places to the database, etc., but those all seemed like a lot to ask just to enter a contest. I recently wrote a Twitter bot for Nelso, to help users look up business info in Europe. So the contest I decided on is to use this bot to try and crowdsource some data about what bars and restaurants are popular in Prague. Rather than explain the contest here, I'll just point my readers to the contest page on Nelso.com: On Saturday, April 26, 2008, check in with Nelso on Twitter and win an iPod Touch! 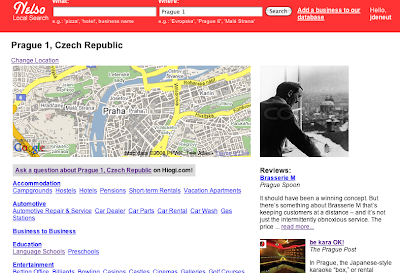 On our English-language Europe local search pages we've switched to AdBrite for text ads. We'll leave these up for a little while to test how they do in comparison to the Google AdSense ads we've been running for the past few months. According to an article on Deutsche Welle, two women from the Dominican Republic drove from Italy to Munich to pick up their niece who was actually on the Paris-Monaco train. How did this happen? Well, in Italian, the name Monaco is used for two cities: the famous playground of the rich and famous on the French Riviera, and the German city of Munich. For this reason, the city of Munich is often referred to in Italian as "Monaco di Baviera" (literally "The Monaco in Bavaria"). Skagen is one of the more popular holiday destinations for Scandinavians (and Danes in particular). This little fishing village is situated in the far north of Denmark (map), where The North Sea and Kattegat meet, and is a very popular place for sailors. During the summer season the small harbor is crowded with sailboats from all over the region. 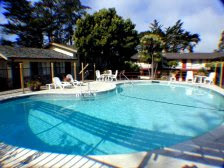 When you are not on the water, the village offers a large variety of excellent seafood restaurants and other nightlife. If you are considering a trip to Skagen please make sure that you book well in advance since the hotels and vacation homes get booked very quickly. This is a new record for us. 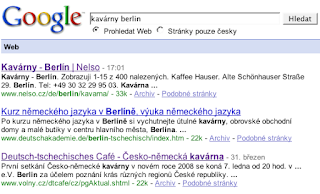 It took only 24 hours to rank #1 when searching for cafes in Berlin (see search results on Google). 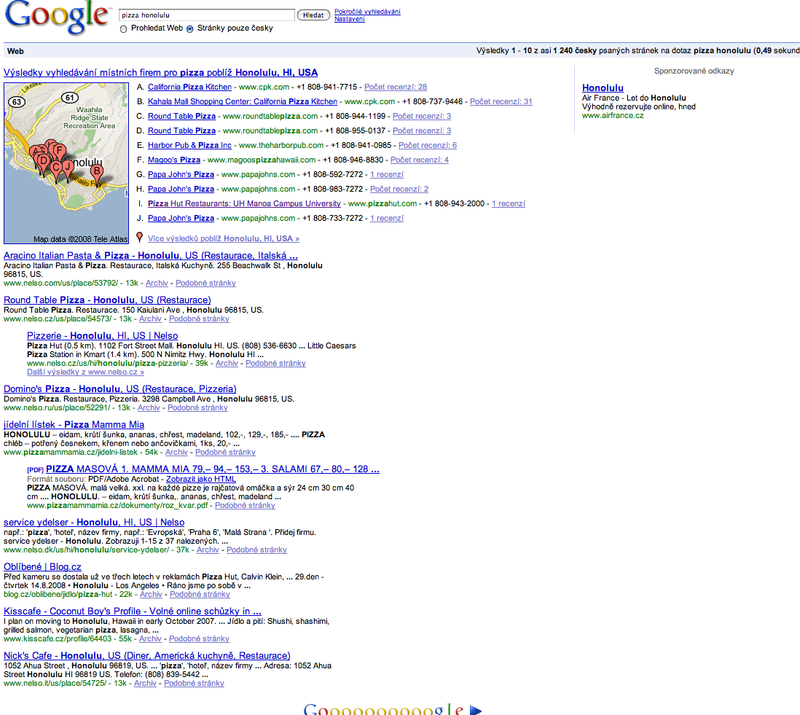 But perhaps this was too easy, optimizing for a search term in Czech. Let's try another one: ristoranti berlino. It should be considerably more difficult to rank for an Italian-language search for restaurants in Berlin. We'll check back in a few weeks and see how we've done. Update: Right after I posted this, we not only lost our top spot for this query, but all our Berlin listings seem to have been removed from Google's index. No idea why.